|| Our Stella girl hasn’t been doing that great. Ever since we picked her up from boarding after Thanksgiving, she’s not wanted to eat, has been throwing up and has been losing weight. She’s been with us for nine years, and we’re hoping for many more. || There’s been so much delicious food this week. 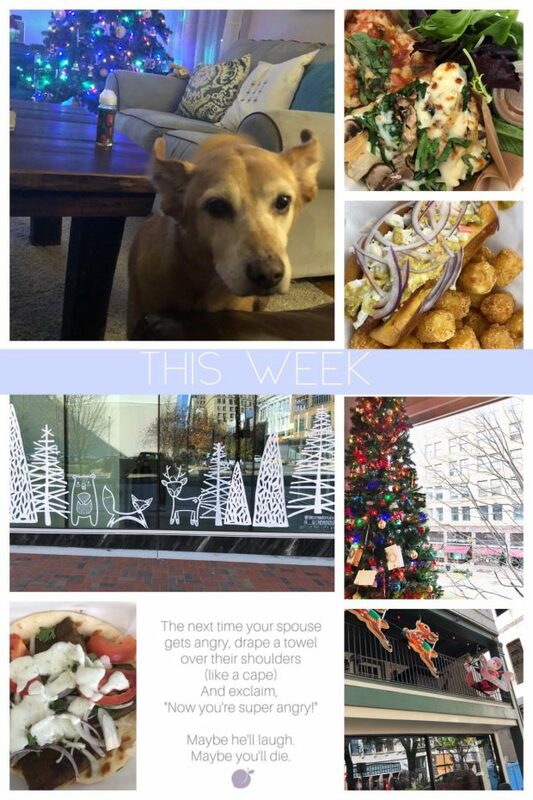 Pizza and salad from Trattoria, the slaw dog from The Standard in the Pizitz, and gyros from Makarios. Definitely not sad about it. || All the Christmas decorations! #decktheham at The Pizitz, and the fun Santa display that is literally two doors down from where I work. They also have a super fun train village in their main window. || I came in early a few times this week, and our work Christmas tree was lit, all the lights were out and Christmas music was playing. It was so peaceful and so nice, and I really enjoyed those solo 10 minutes before the start of work. || That little funny about being super angry — never a bad time during the week for a little laugh. I hope you guys have had a great week, and have something fun and Christmassy planned for the weekend! LOLOLOL The super angry is cracking me up!!! I haven’t had a chance to walk around town to see the Christmas decor yet. Or you know, leave the office at all. I made it to the lobby yesterday, so that is something! I know we have a beautiful tree out my building. And because I come and go out our side entrance, I haven’t even seen Regions lit up and it is LITERALLY across the street from me. I hope to stop and “smell the roses” this week! And you know, us go to lunch TWICE! I am so sorry to hear about Stella!!! Poor girl. I am sending her all my hugs. And you too, of course. I hope she starts feeling more like herself. Yes, you’re right across from Regions!! You need to ‘gram that shizz ASAP. – it’s so beautiful! I can’t wait to finally get to go to lunch this week at some point! Stella thanks you for her hugs – she’s headed to the vet tomorrow, so hopefully it’s nothing too serious.